What often decides people to have dental implants as opposed to dentures is that the implants are generally permanent once they are put in – they last up to 25 years with proper care – and are secured in your mouth. They act like natural teeth and are in no danger of slipping or falling out, unlike dentures. 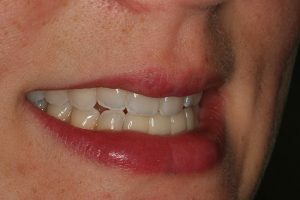 The implants do not have to be removed nightly to be cleaned and soaked – you just brush and floss your teeth as you normally do. Dr. Russell Kiser does dental implants. What will happen when you come to his office for one? The first thing Dr. Kiser will do is to make sure that there is enough bone mass in your jaw to support the titanium screws. If that’s not the case, he may do a bone graft or opt to do mini-dental implants, which actually have a faster recovery rate. With the traditional implants, he will put in the screws and then have a waiting period of up to several months to allow the bone to fuse with the titanium screws. Then he will put in the replacement tooth or teeth… and you’ll feel like you have a brand new mouth. Dental technology is constantly improving and the field of dental implants is no different. Ever since their introduction in the mid-20th century, the companies behind the creation of these screws have gone as far as to make the production process nearly completely automated. Also, while titanium was viewed as the best material for the screws due to their relatively safe interaction with people’s jawbones and gum tissues, there are some that are trying out different materials for those screws, which may become more commonplace as time goes on. 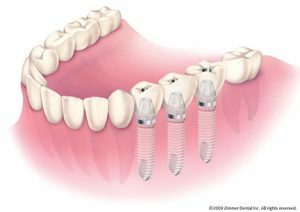 Another advancement has been the All-On-Four implants, which means a person can get a whole upper or bottom set of teeth on four screws. This is being hailed as a big change in the dentistry field, since it can save so much time and reduce a ‘jigsaw-puzzle type feel to those who are missing a lot of teeth at once. It will be quite exciting to see what the next advancement in the field of dental implants is. Dr. Kiser, who understands that all of this can be seen as a big undertaking by patients, has some closing thoughts about how dental implants should go as a patient and how he feels a dentist should handle them.